Boasting 537 luxurious accommodations, the St. Louis Union Station Hotel offers guests a relaxing experience in a historic setting. 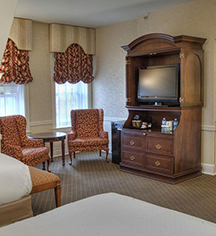 Each guestroom and suite is equipped with essential amenities to ensure a comfortable stay. Guests can choose from the amenities guide and select a room that’s right for them on the unique railroad themed floors. Guestrooms - Perfectly seamless assembly of modern conveniences and traditional features in these deluxe accommodations. Suites - Enjoy a lavish collection of spacious suites furnished with large living areas to ensure extra comfort. Executive Rooms - Guests staying in Executive Level accommodations are private access to the Executive Lounge, featuring complimentary breakfast, and complimentary evening appetizers and drinks. 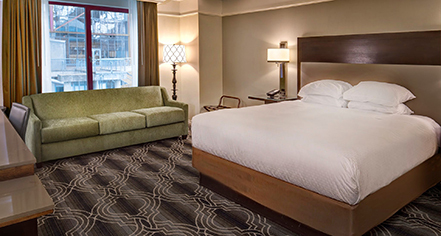 Accessible Rooms - In addition to the standard luxury amenities afforded in all of St. Louis Union Station Hotel's accommodations, mobility and hearing accessible rooms are furnished with a roll-in shower and other accessible features, including audio and visual devices and alarms. St. Louis Union Station Hotel, a charter member of Historic Hotels Worldwide since 2015, dates back to 1894.